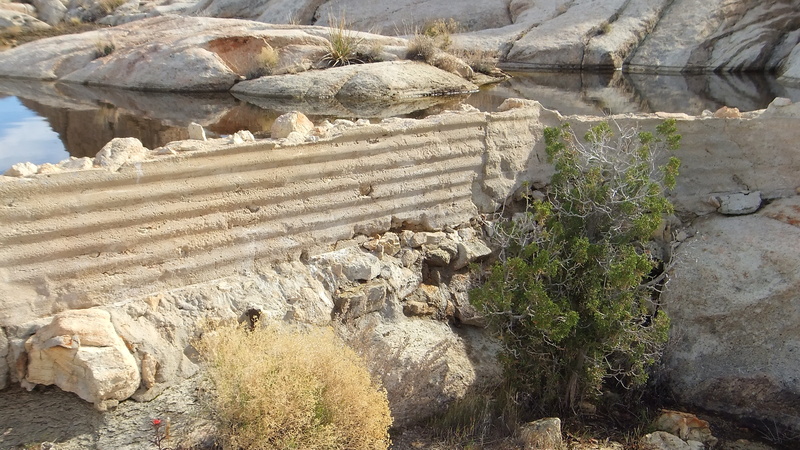 SEVERAL DAY-TRIPPERS AND PROFESSIONAL PHOTOGRAPHERS have photographed this smart-looking little dam in the years since I first posted photographs of it on my website. 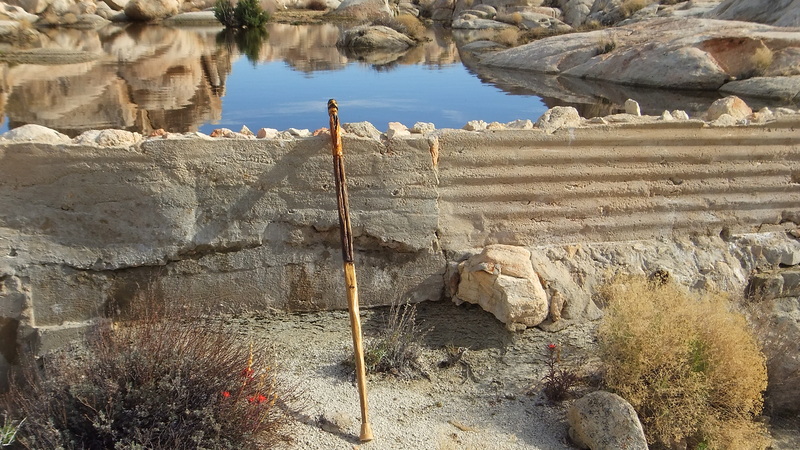 Robert Miramontes, in particular, has taken some beautiful, often-time surreal photos. 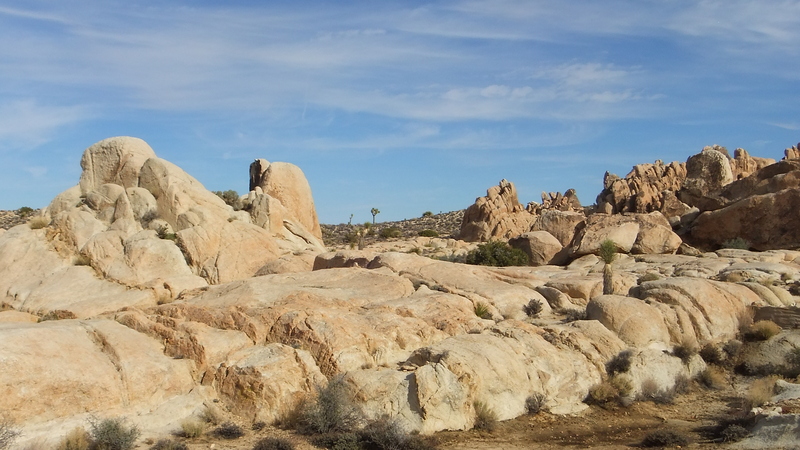 If you are a Facebook user, check out Robert’s posts HERE. 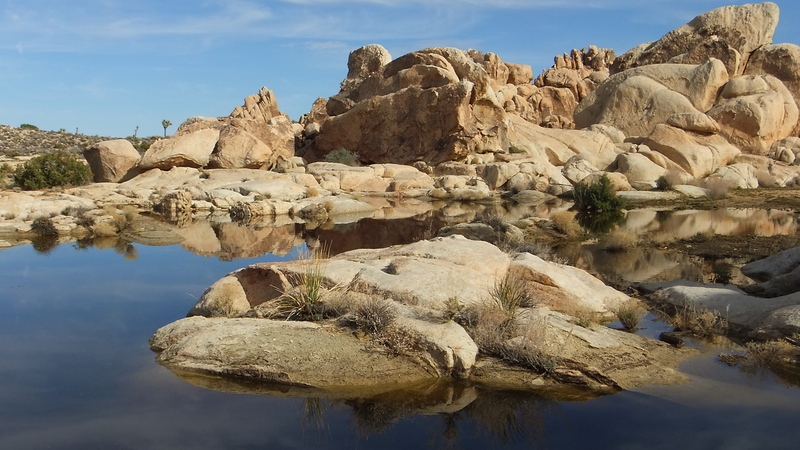 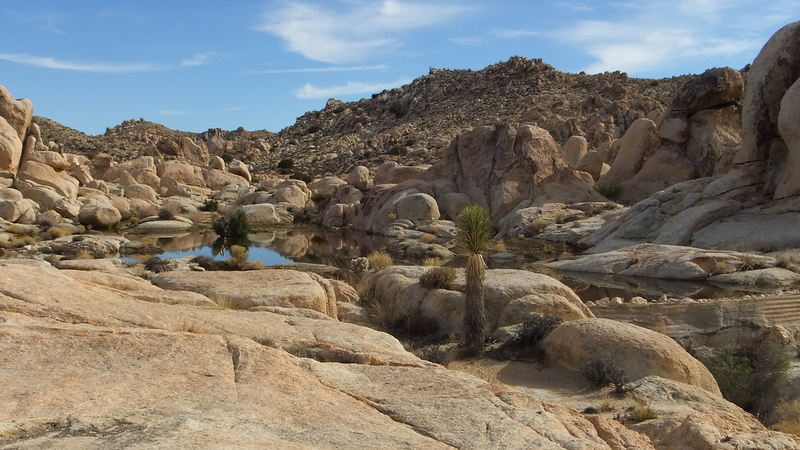 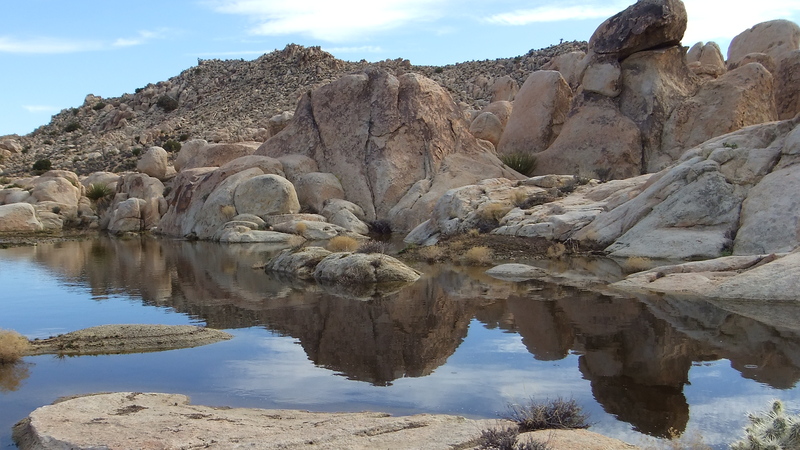 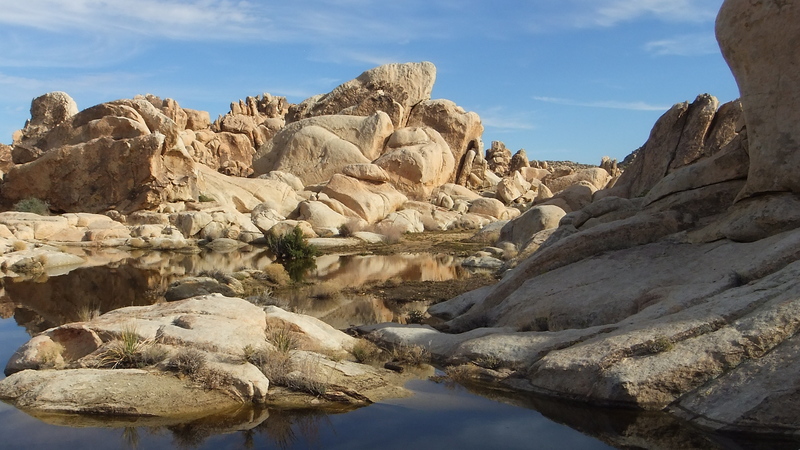 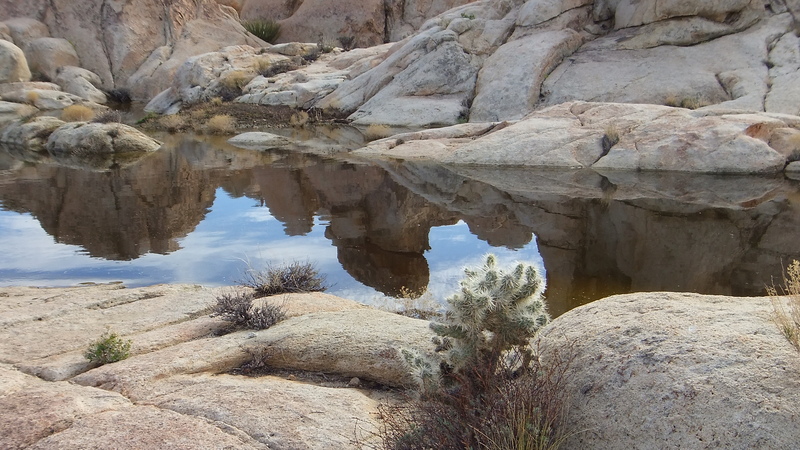 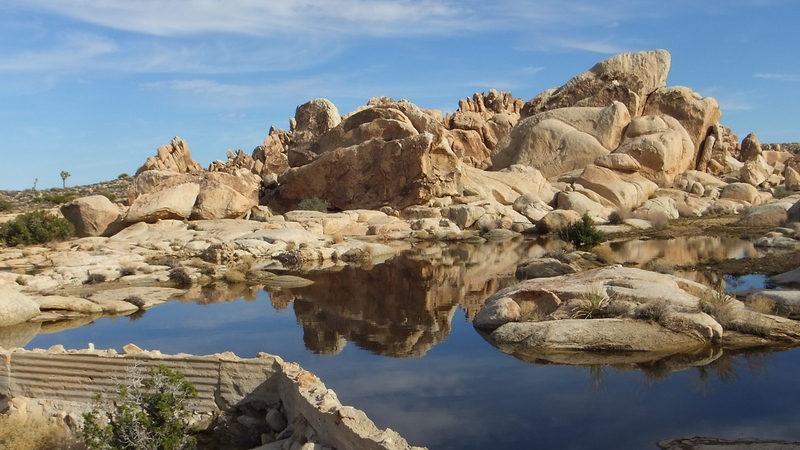 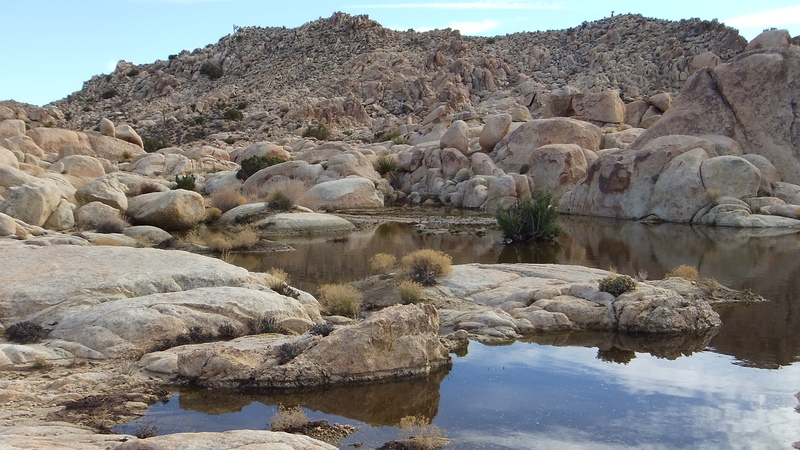 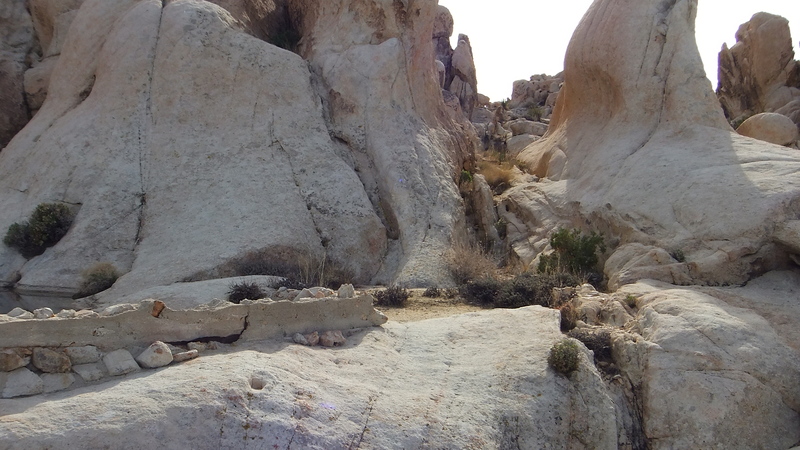 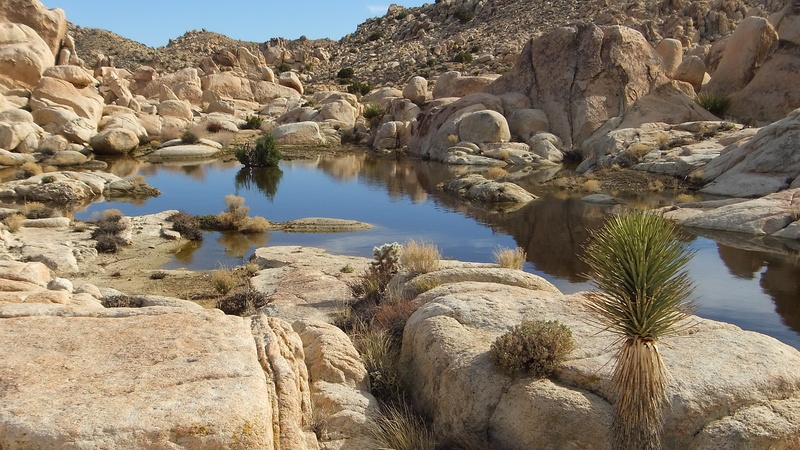 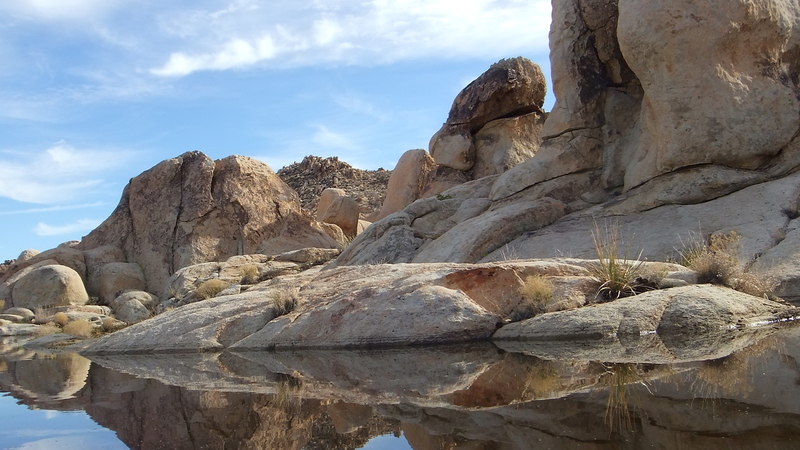 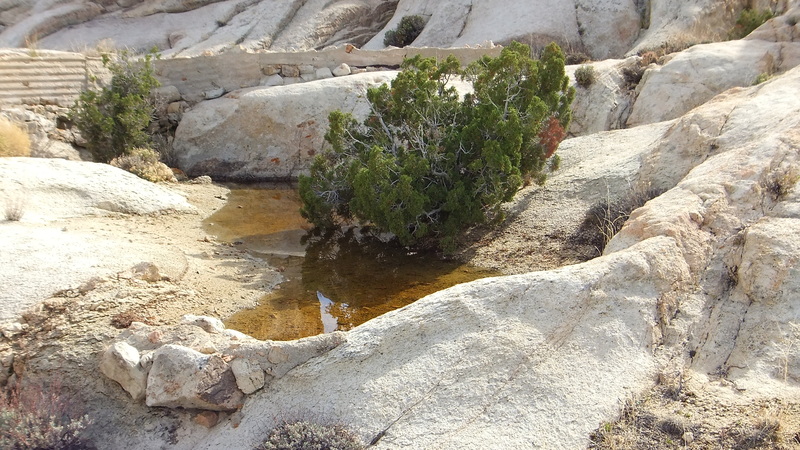 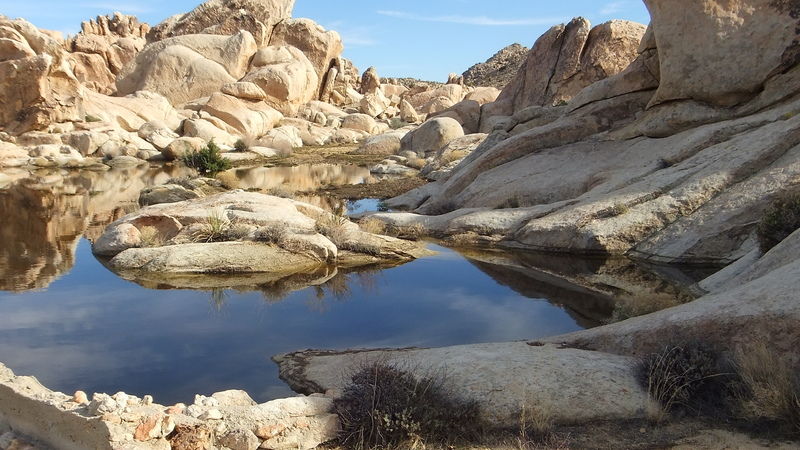 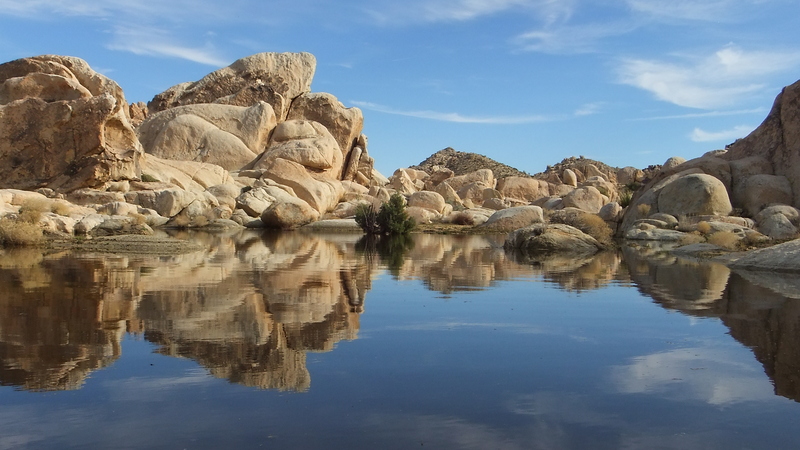 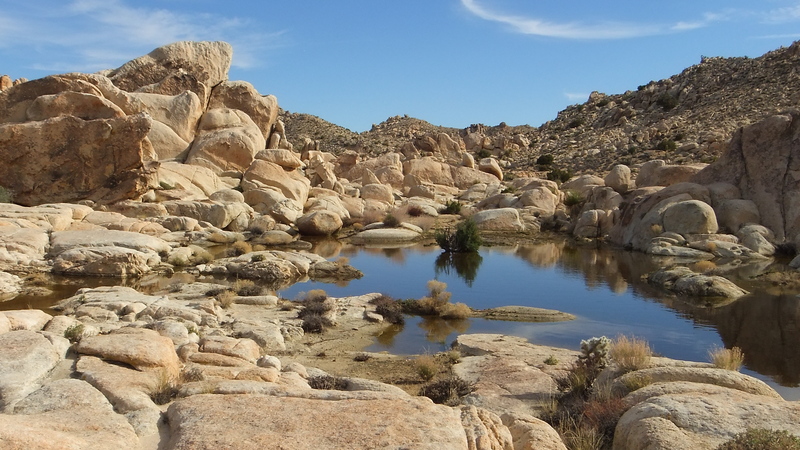 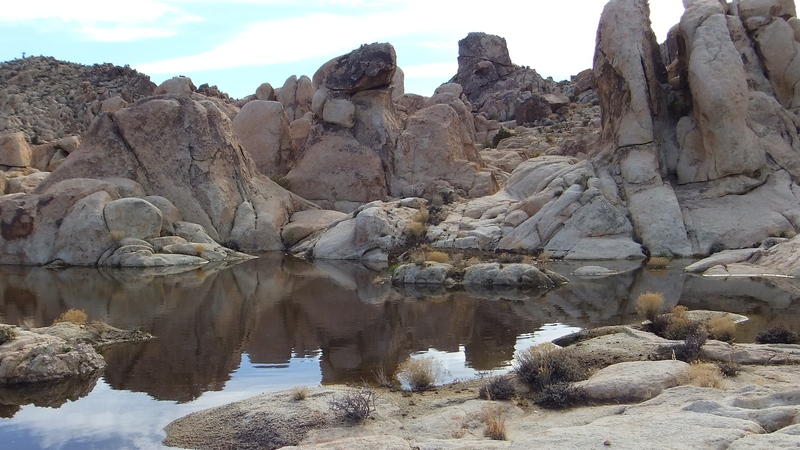 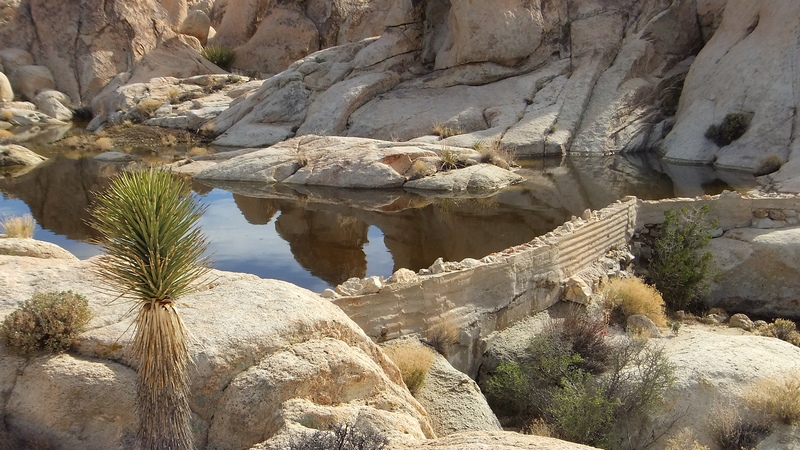 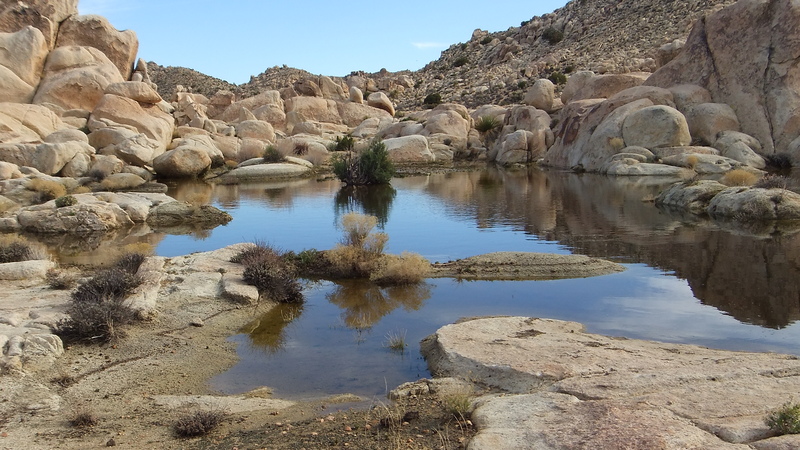 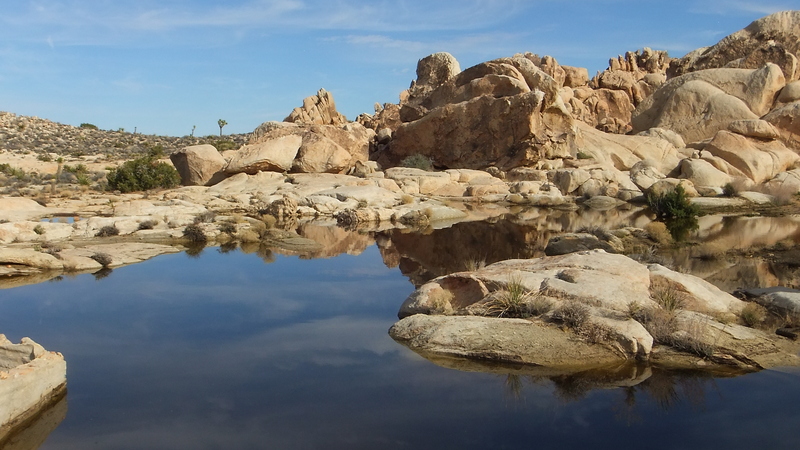 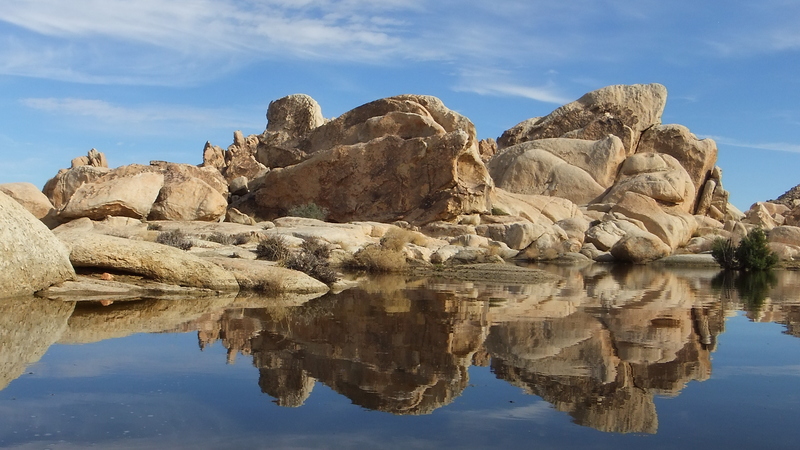 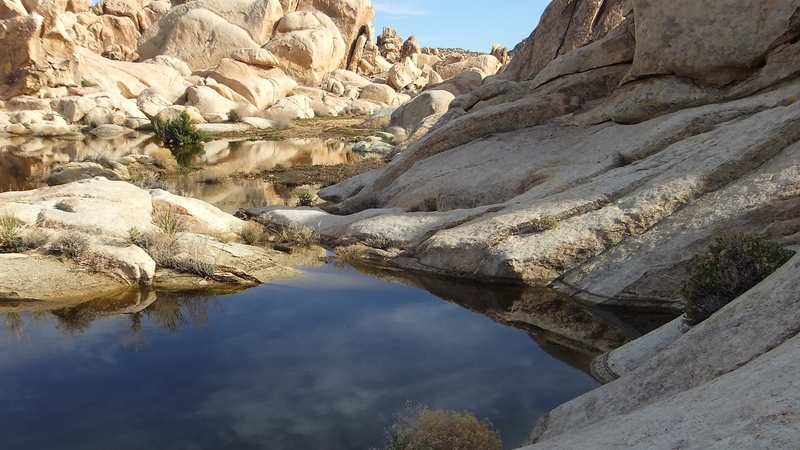 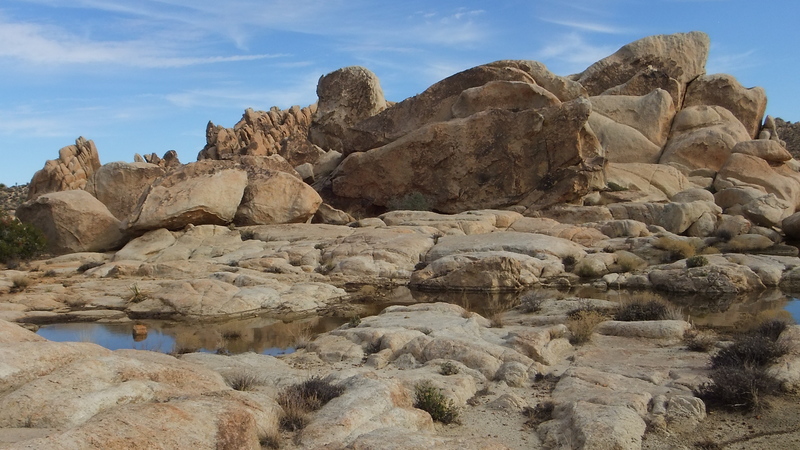 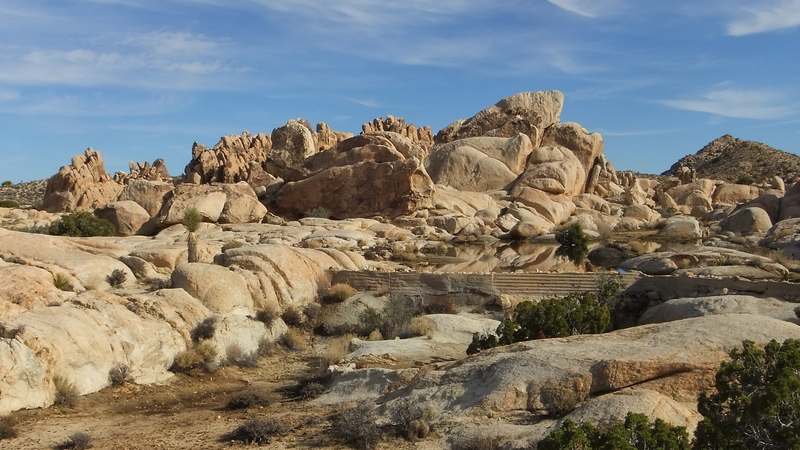 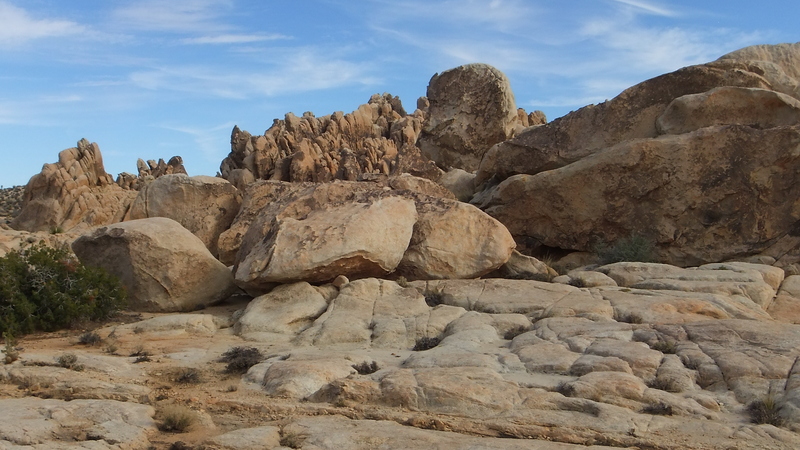 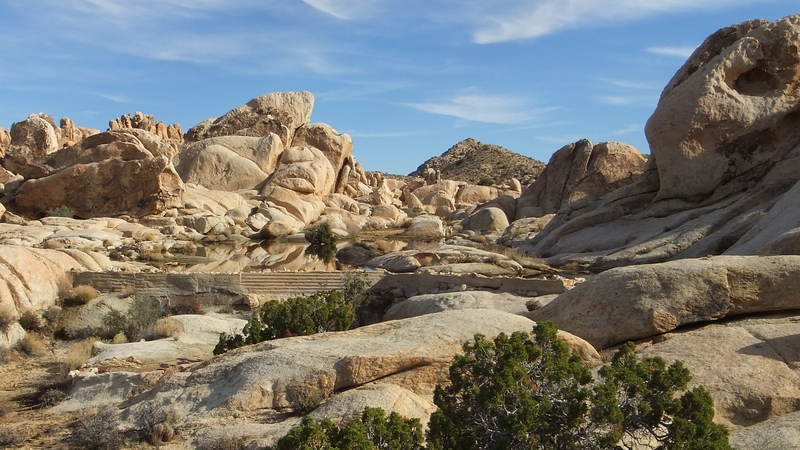 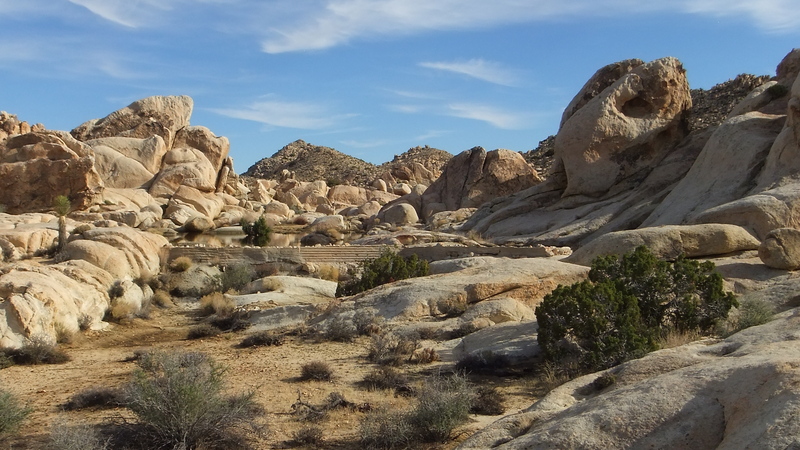 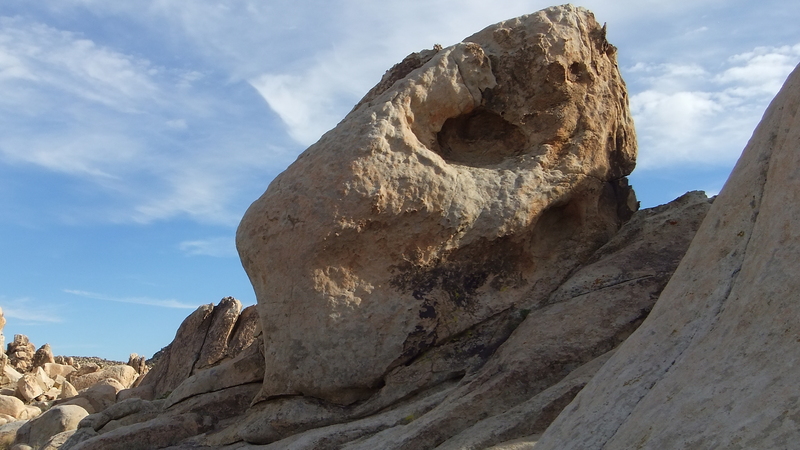 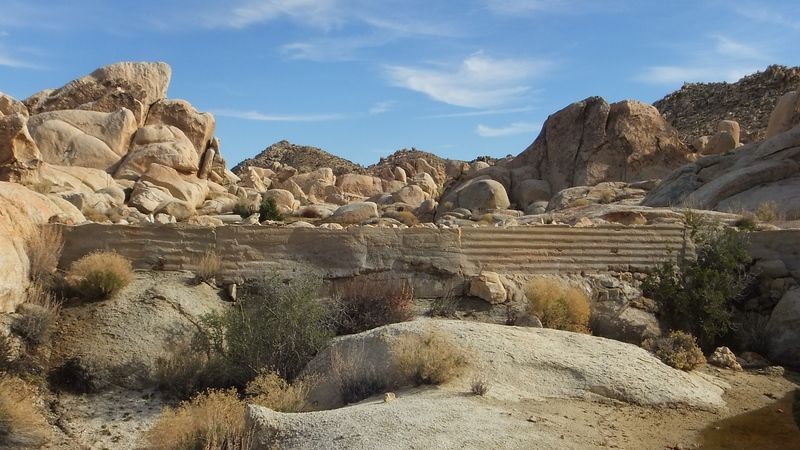 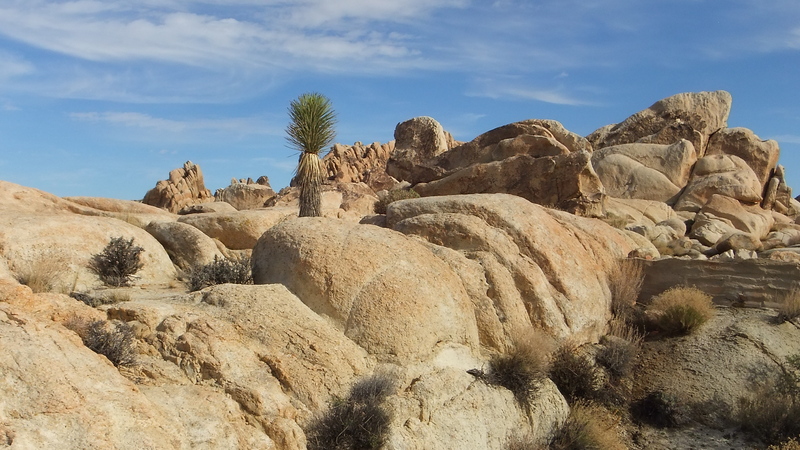 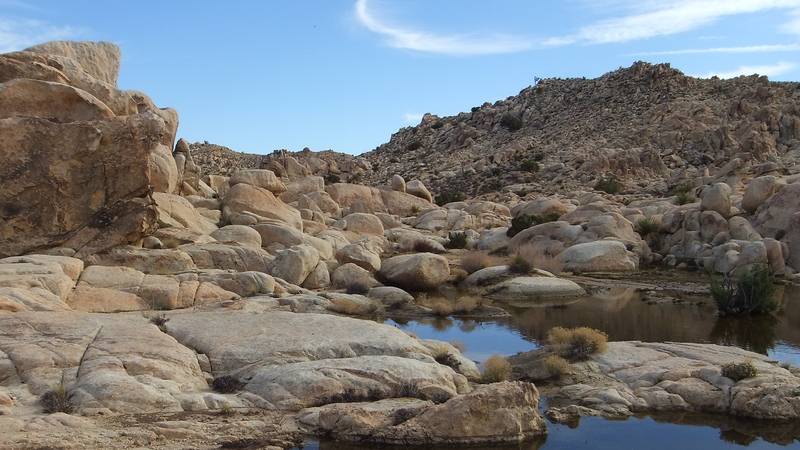 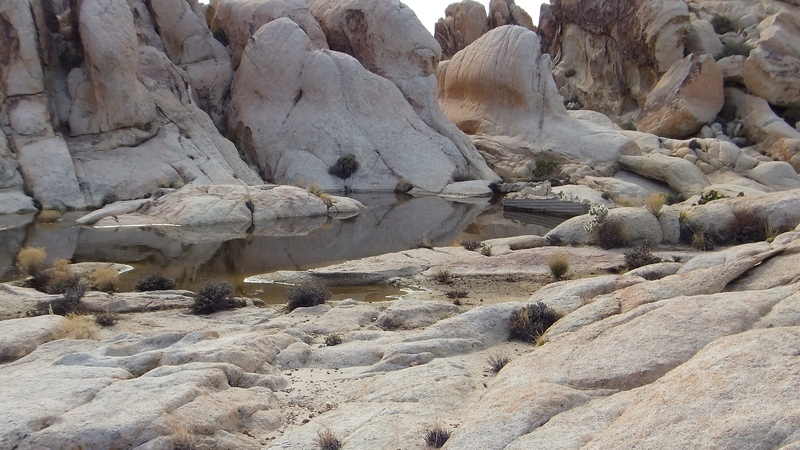 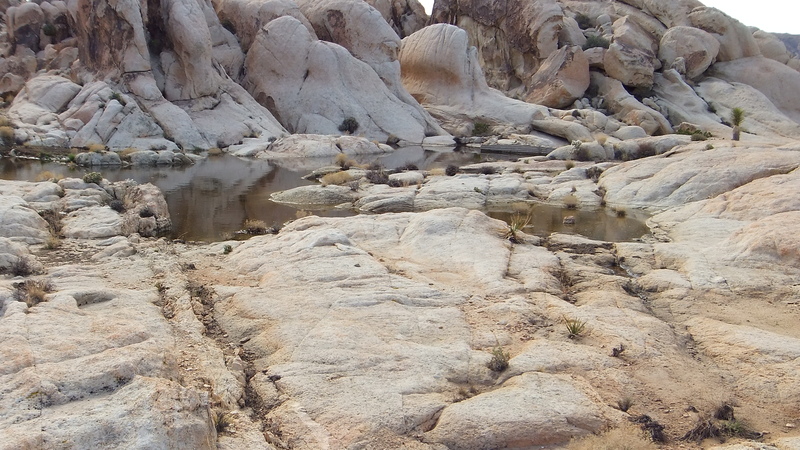 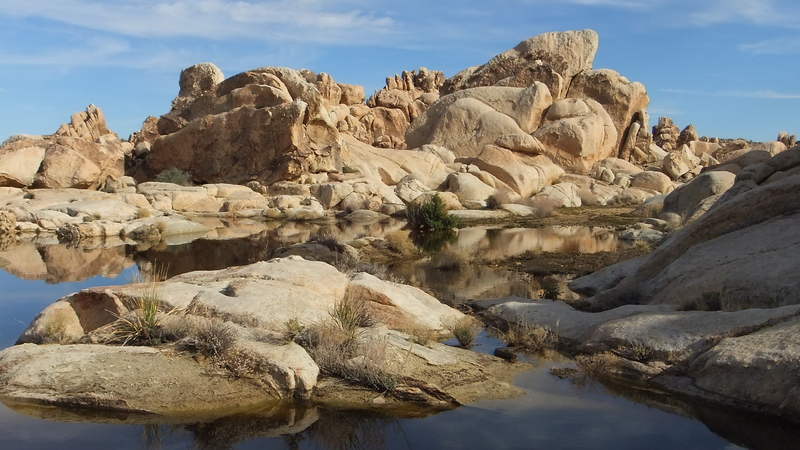 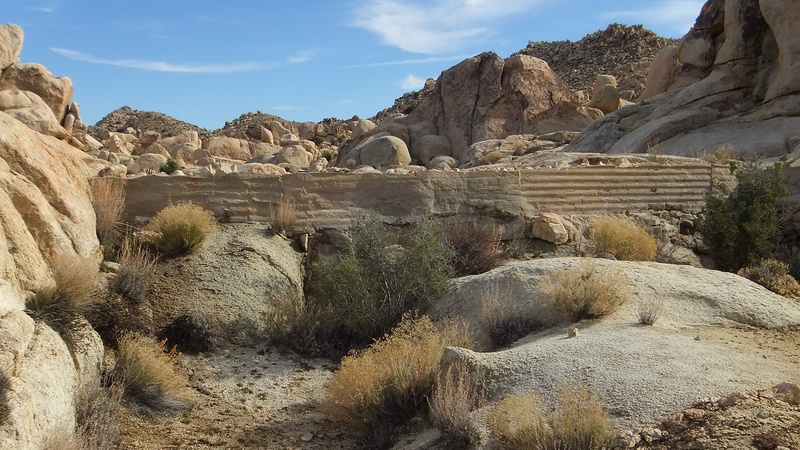 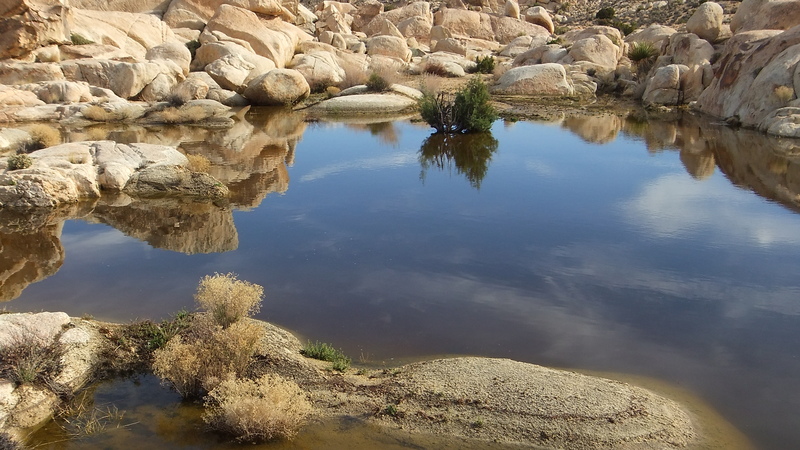 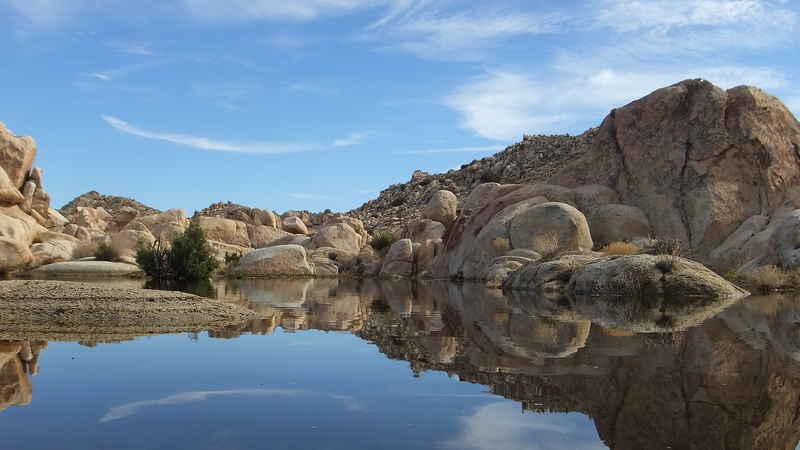 Joshua Tree National Park has two rainy seasons, winter and summer. 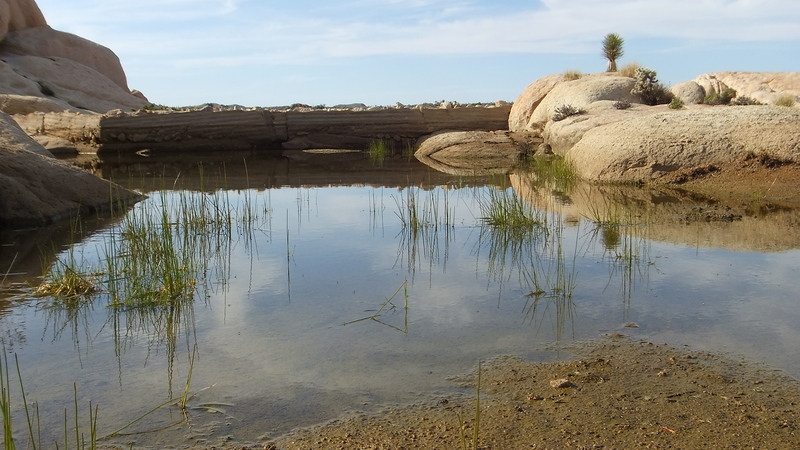 On my discovery trip in 2014, the Black Rock rain gauge had recorded 2.25 inches of rain in the park. 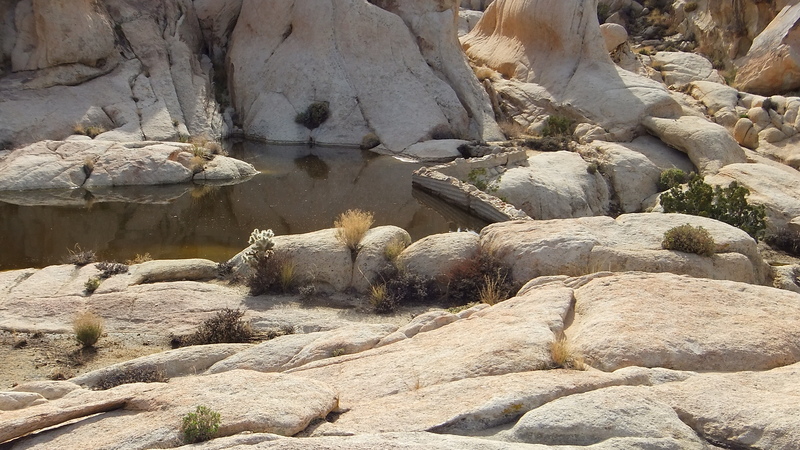 That was three days before I arrived. 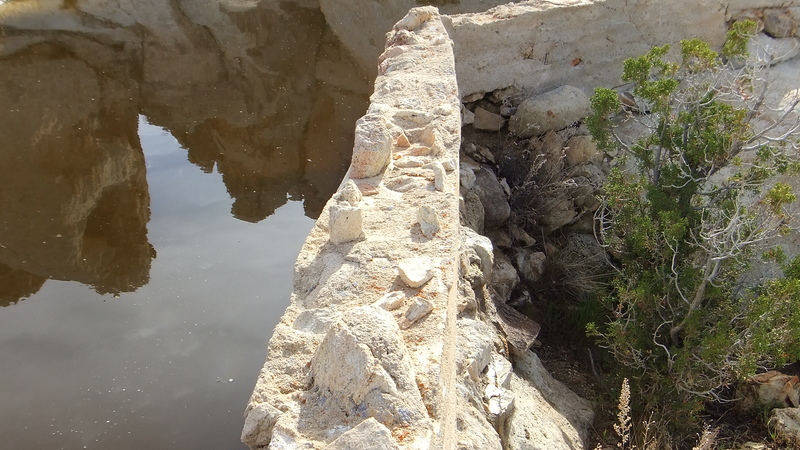 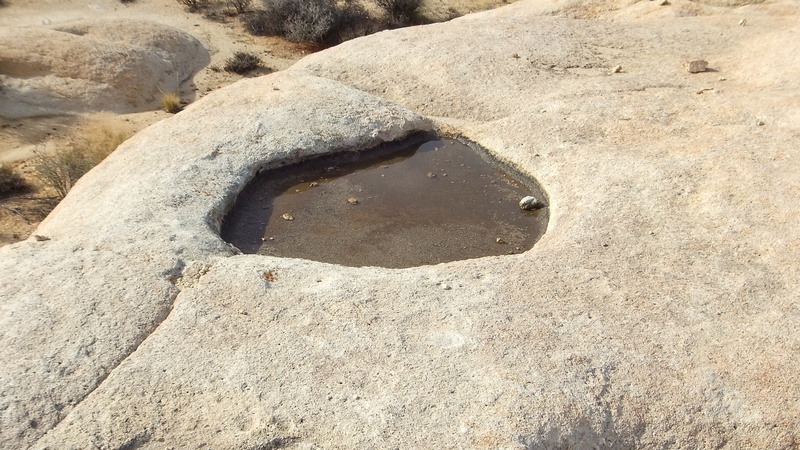 Between 2014 and the present (February 2017), others have posted their pictures of this small cement-and-rock Tank with varying amounts of water in it. 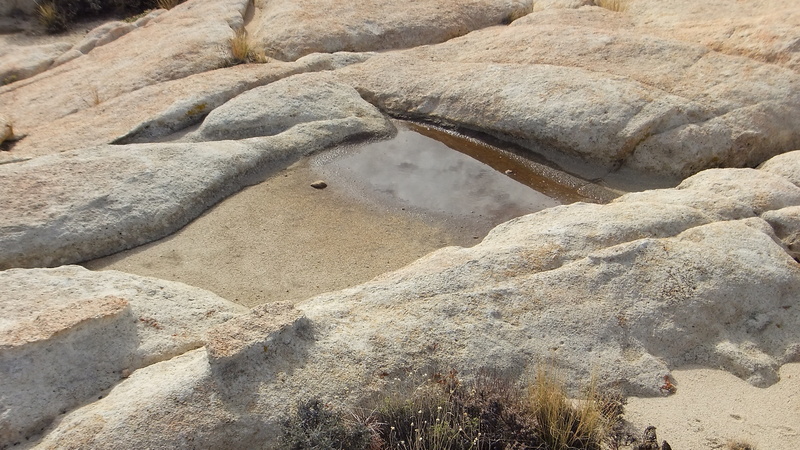 No leaks that I can see, it fills and evaporates several times each year, presumably. 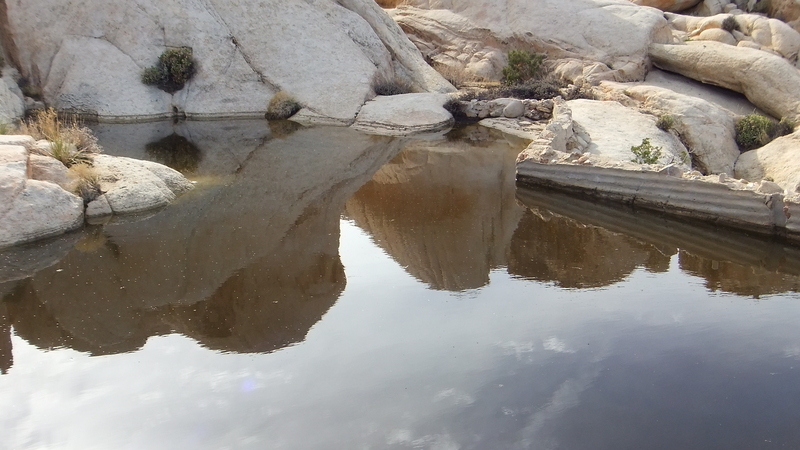 Timing is everything! 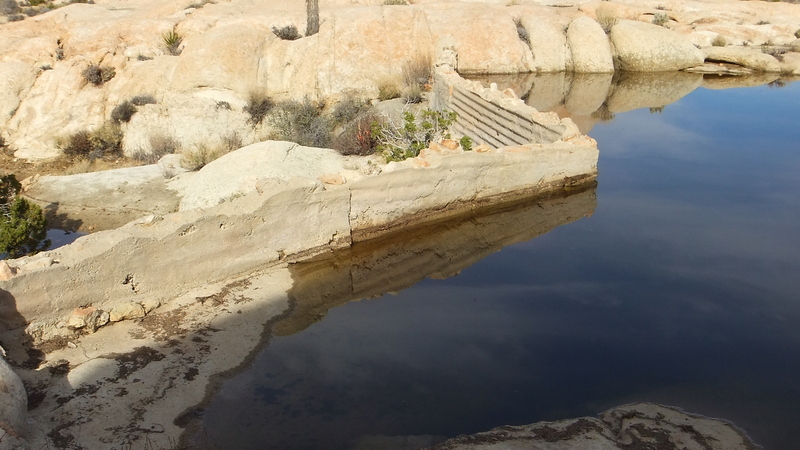 When I made a return visit to Surprise Tank 25 days later, sadly, most of the water had evaporated (image at right). 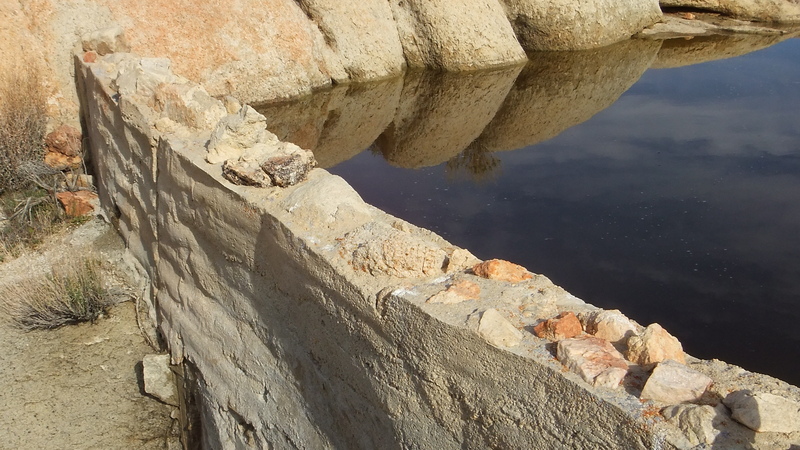 This small dam can be found at the north end of Towers of Uncertainty. 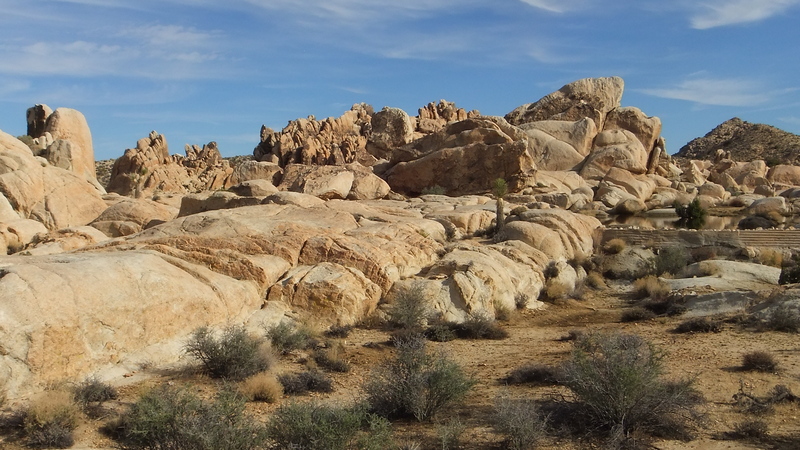 Take Geology Tour Road to the Back Country Board (Stop 2). 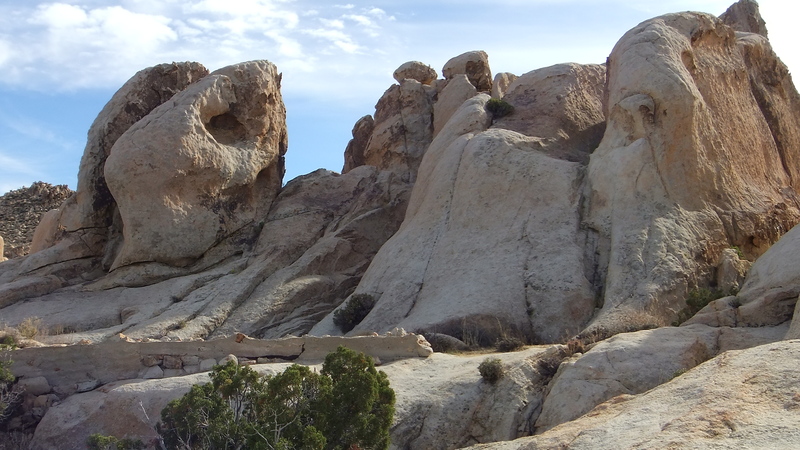 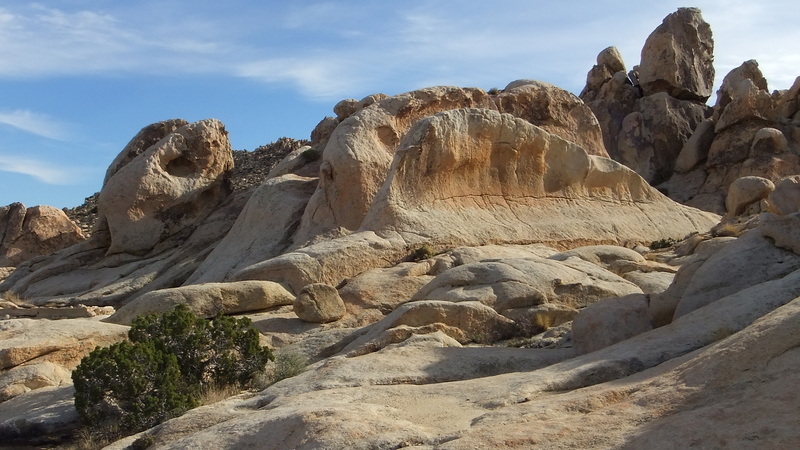 Once you park, cross the road and head southwest toward the low rock formations just off the Riding and Hiking Trail in that direction. 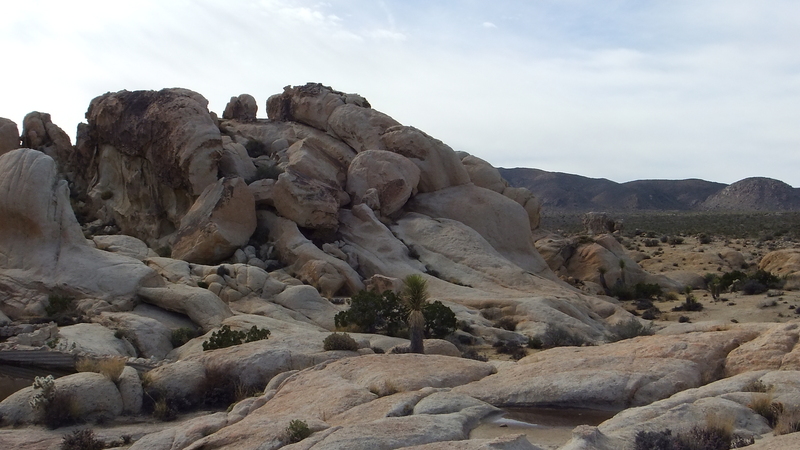 Distance: approx. 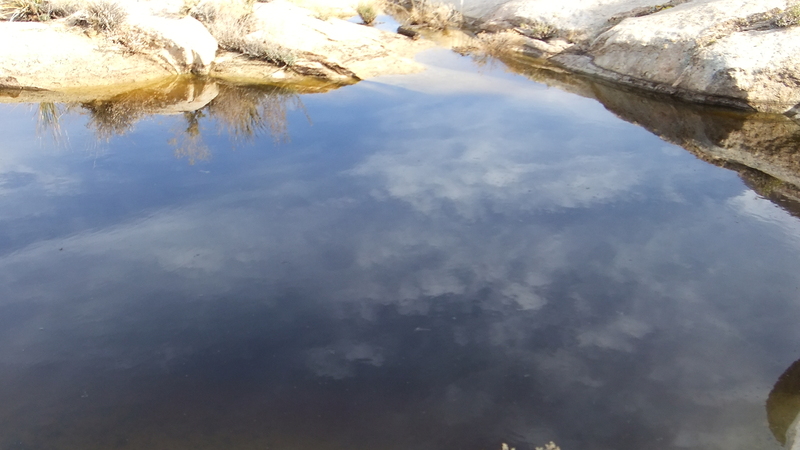 7/10th mile. 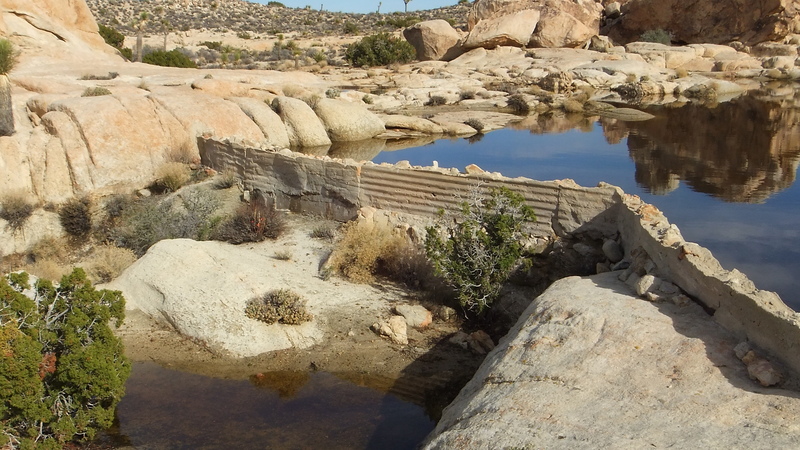 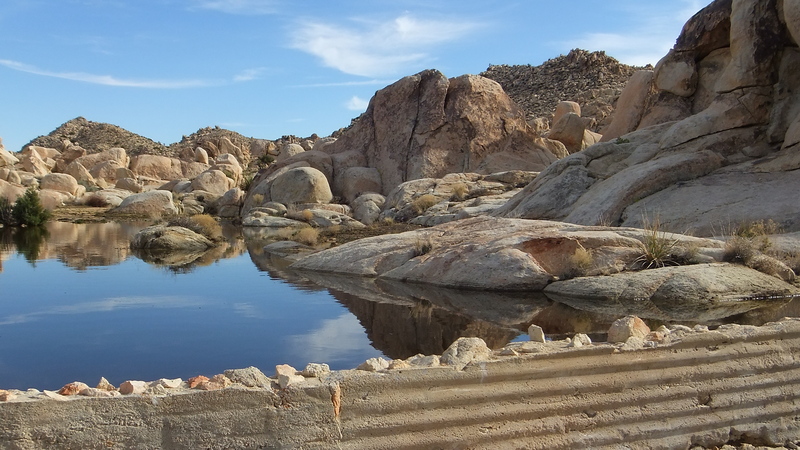 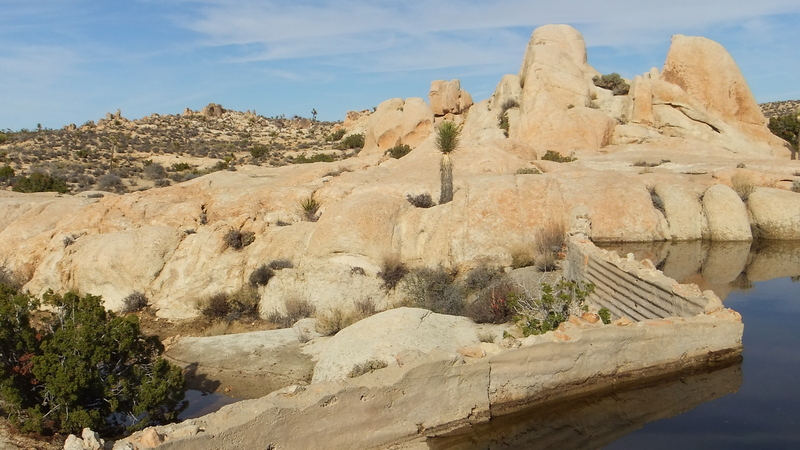 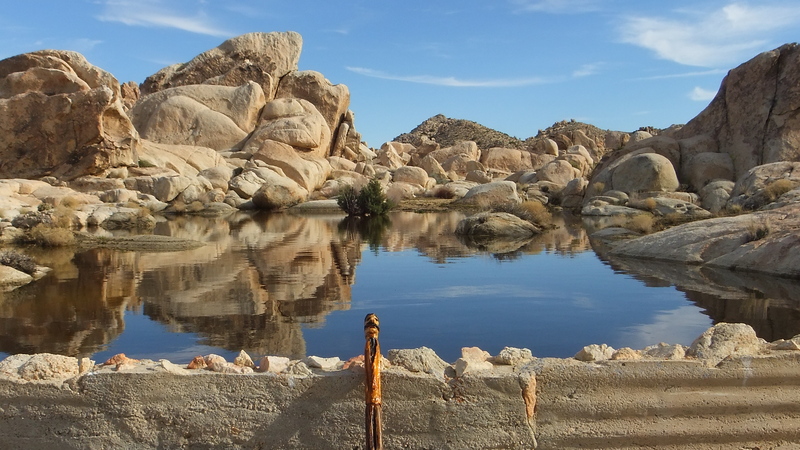 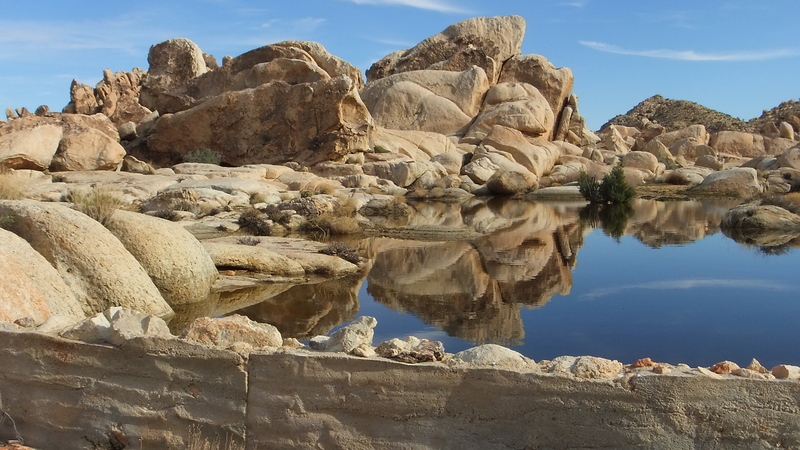 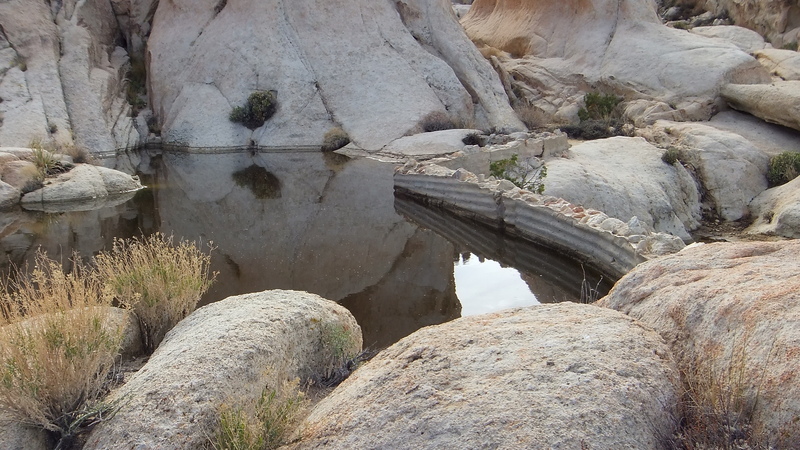 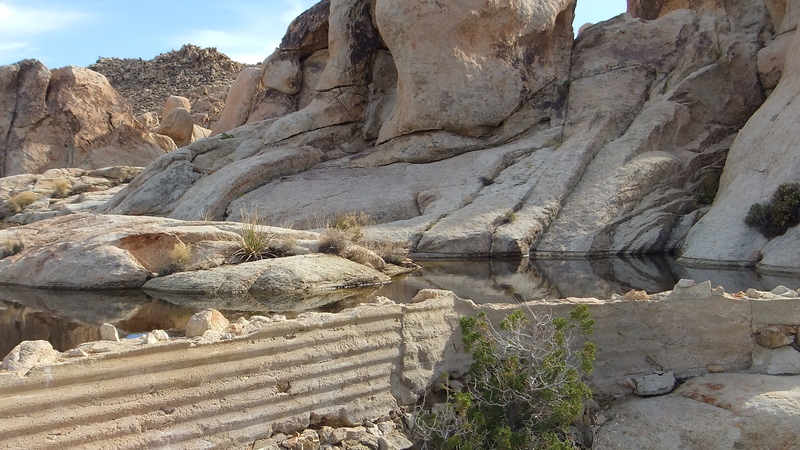 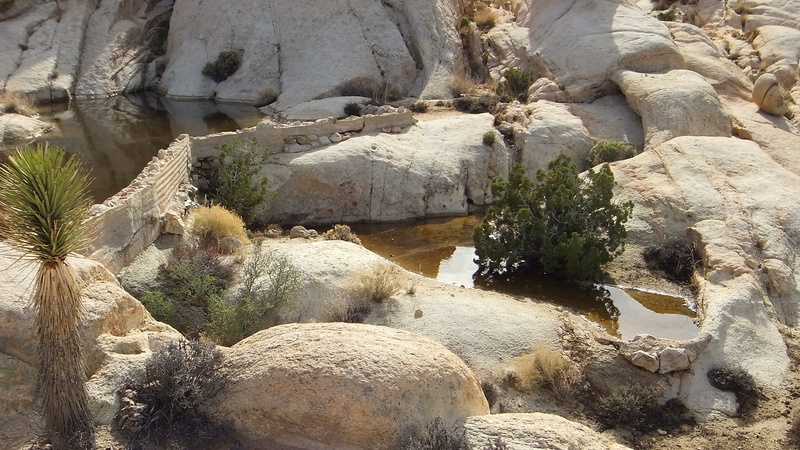 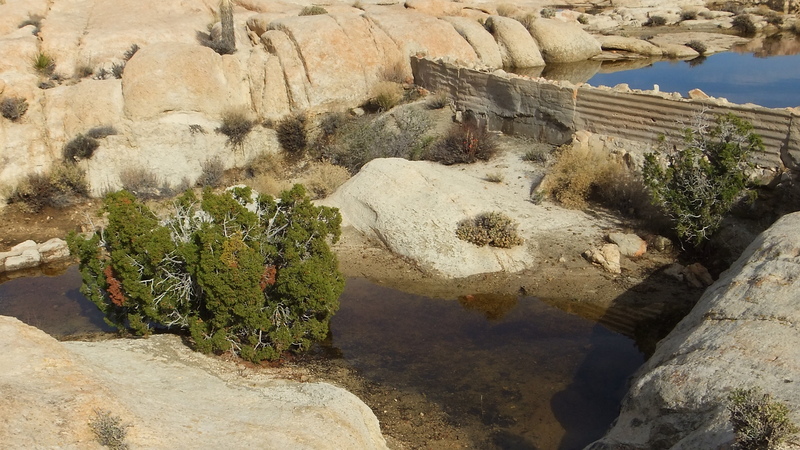 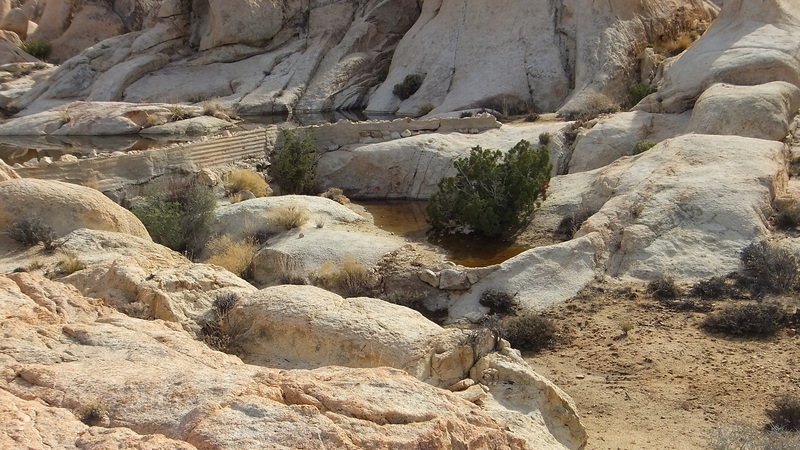 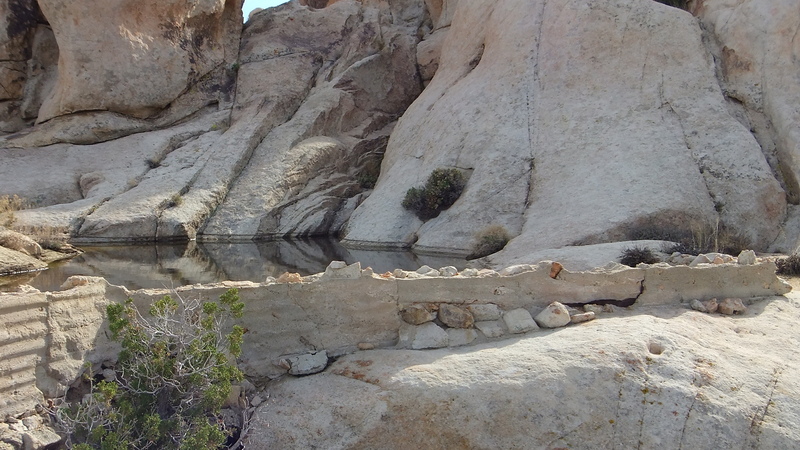 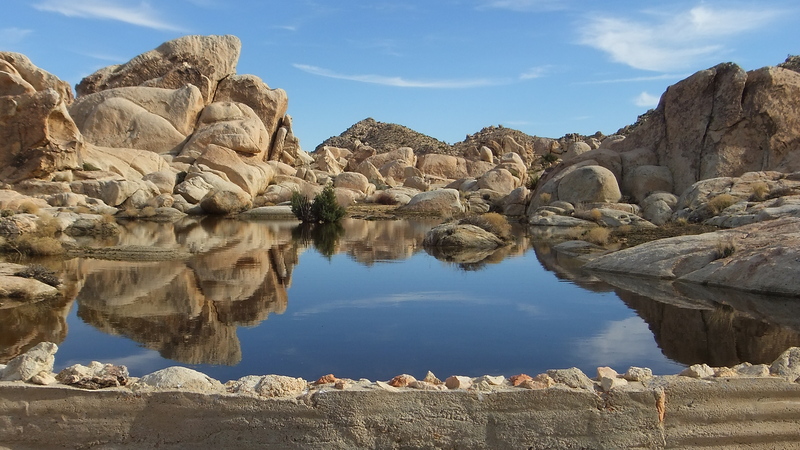 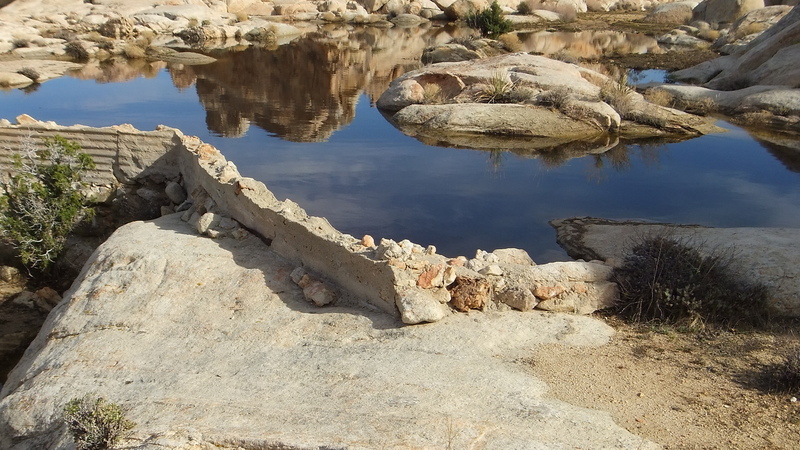 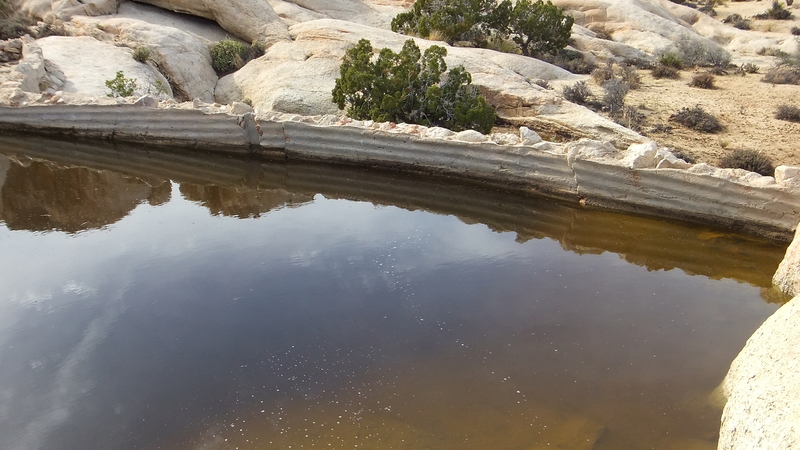 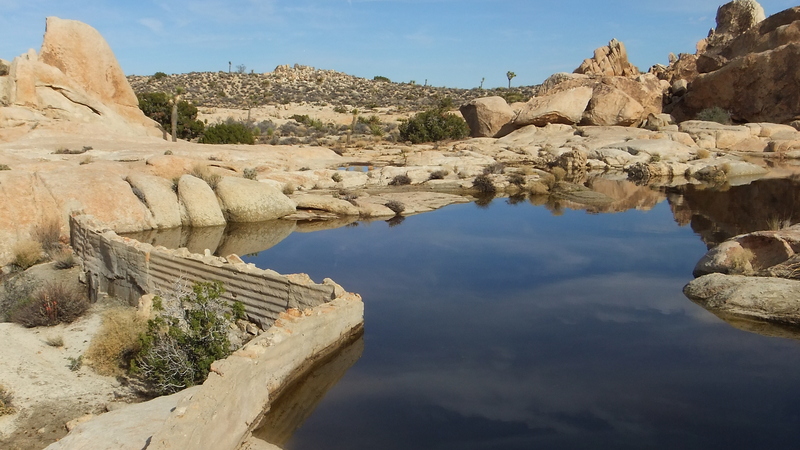 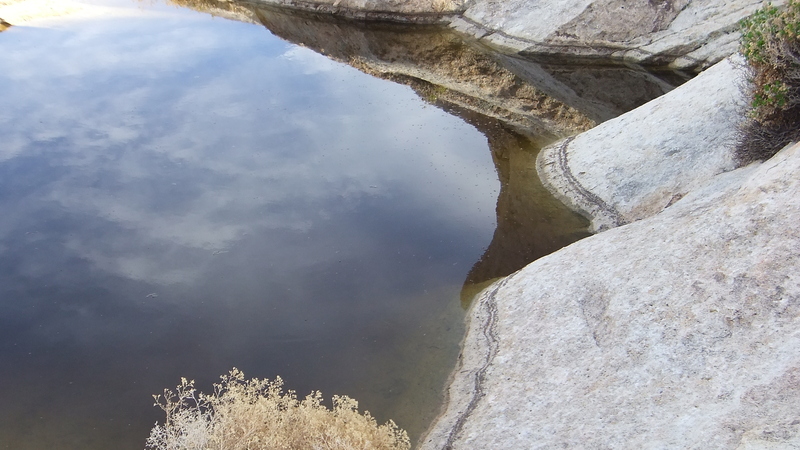 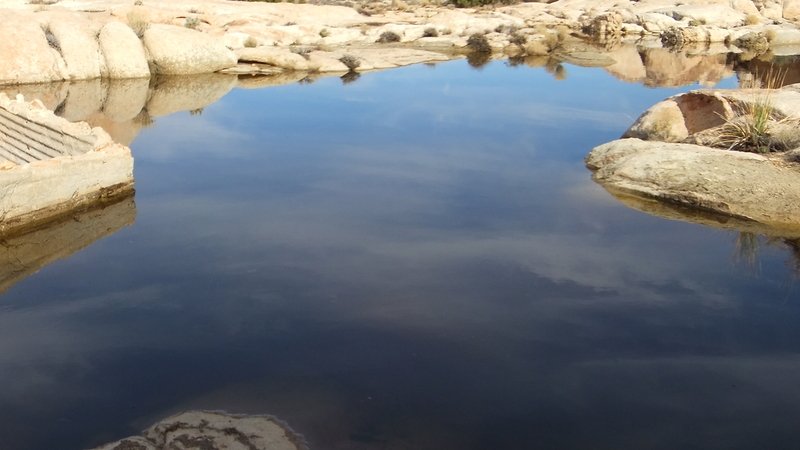 Thank you for visiting Surprise Tank at Joshua Tree National Park.